Do you use Facebook and Twitter and tired to post the same message, photo or video on each site separately? Or ever wondered how to share one of my SMS on Facebook wall and Twitter? Ever wondered how to share and post a nice quote, a joke or a greeting SMS that you received, with friends and family on Facebook and Twitter. With Droid2Wall you can do that easily. Simply choose the SMS to share and there you go. No need to update your Facebook wall and tweet the same thing. 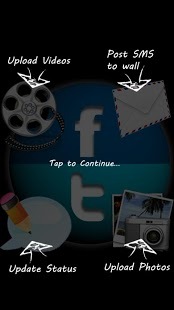 With Droid2Wall you can update both with a single tap. Uploading videos simultaneously to both Facebook with friends and Twitter for people following you. Either upload from the video gallery in your phone or capture the memories while on the go and share. Currently, only 5Mb video can be uploaded. Please contact our support team for suggestions, feedback and for any issue you encounter. We are here to help. Exactly what I wanted! Upgraded to a new phone recently and the old app that came with my old phone was no longer there…looked EVERYWHERE for something so simple, and finally found it with this. Just what I wanted, something that will update both with one click and has a widget to go along with it for easy access~ The only thing I miss about my old one is the character counter, since Twitter messages have that limit! Thanks a bunch! Suleman Really handy, if u are freak of sharing instantly your updates. Its indeed a great application. Doesnt work Connects to facebook fine but wont let me authorize the twitter app on my s2. Tried clicking the link as it wasnt redirecting me back to the app but . . . Nothing. Swiftly deleted as there are now other apps out there like this that actually work!